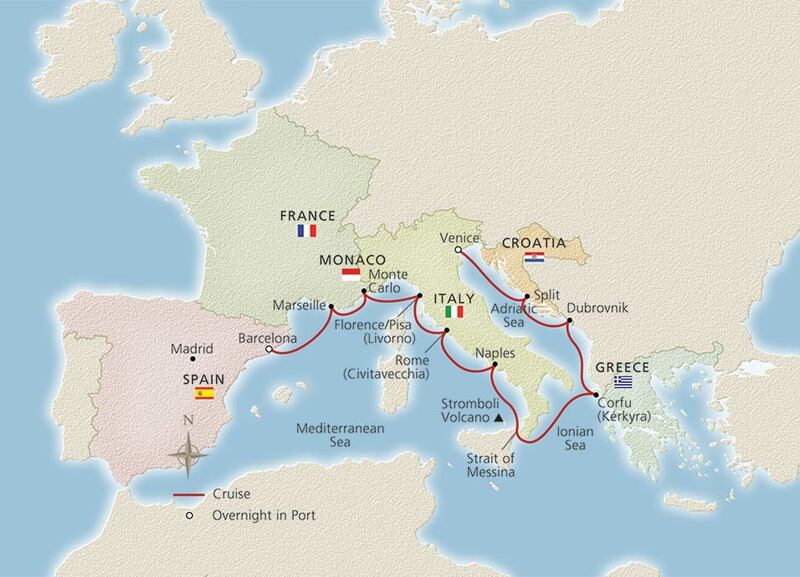 Set a course for unforgettable exploration to some of the Mediterranean’s most interesting ports: the fabled towns of Tuscany, historic Rome and canal-laced Venice. Enjoy ample time to savor Barcelona’s easygoing spirit with an overnight stay. Discover the French Riviera’s seaside pleasures in Marseille and Monte Carlo. And visit Dubrovnik, a hidden medieval jewel. Along the way, gracious hosts, fine regional cuisine and an award-winning Viking ship connect you to this remarkable region. Explore the “Eternal City” today with a local guide. Marvel at the magnificent Colosseum, where gladiators once battled; the historic Roman Forum, gathering place and political center of the ancients; and Vatican City. You might also choose one of our fascinating tours that highlights Rome’s treasures. Alternately, visit Tarquinia’s Etruscan necropolis or the excavated town of Ostia. In Naples, your choice of excursions abounds. Take in magnificent examples of Greek and Roman architecture and the Piazza del Plebiscito, the grandest public square in the city, facing the former Royal Palace of the King of Naples. Optionally, also explore Herculaneum, Italy’s “other” Pompeii, drive along the stunning Amalfi Coast, or take a trip to the summit of Vesuvius. In your spare time, sample a hot espresso, a slice of pizza (the world’s first pizzeria opened here in 1830) or a locally made limoncello. Bask in the endless comforts of your ship. Swim in the infinity pool, which offers dramatic sea views. Relax with a massage or nurturing skin treatment at our Scandinavian-inspired spa or learn to make the perfect risotto during a cooking class at The Kitchen Table. Or, simply take refuge on your stateroom veranda while passing the “Lighthouse of the Mediterranean,” the active volcano of Stromboli. Spend the entire day on the romantic island of Corfu, resplendent with charming pastel townhouses and pristine white beaches. Our included tour takes us on a drive to Kanoni, where we will make a photo stop to view tiny Mouse Island and the Vlacherna Monastery. Following the coastline through Garitsa Bay, you will reach the UNESCO Site of the Old Town. See the fabled Esplanade, one of Europe’s largest public squares, and the Liston Promenade, once the exclusive preserve of the local aristocracy. Where city meets coastline, you will sail to this beautiful 12th-century walled city in Croatia. And as it happens, George Bernard Shaw declared, “Those who seek paradise on earth should come to Dubrovnik.” We think he has a point. Enjoy an entire day to take an inclusive tour with a drive high up to catch the magnificent views of the city and countryside. Or descend to the coast and enter the city on foot through the historic Pile Gate, passing by the Sponza Palace, the 15th-century Onofrio’s Fountain and stop inside the Dominican Monastery to see Renaissance paintings. You may also wish to consider exploring the famed Dubrovnik Riviera with a cruise along the Lapad Peninsula. Experience the age of antiquity as you wander through the center of the city that is built around the Diocletian Palace, walking through the well-preserved cellars before continuing to the Ethnographic Museum. In this historic quarter, you will notice the results of over 17 centuries of construction, passing pre-Romanesque churches and Gothic chapels. You may also choose more natural pursuits, from a rafting trip on the Cetina River or a journey through the Croatian hinterland to the famous waterfalls of the Krka National Park. Or spend the entire day discovering the small, more intimate destinations along the Dalmatian Coast. Welcome to Venice, where the magical city renowned for its art, architecture and culture is the ultimate destination on your epic voyage. Watch the sunlight dapple on the water as we ease our way into the lagoon. You can enjoy a panoramic boat ride toward the magnificent St. Mark’s Square on your included tour, and with your guide, you will admire the glorious facade of the Doge’s Palace and tour the ornate interior of St. Mark’s Basilica. Or take a boat to Murano to see glassmakers at work in their centuries-old tradition with a stop to visit the historic island of San Giorgio Maggiore. As we will remain in port overnight, enjoy a fine restaurant, the vibrant nightlife and perhaps even a romantic evening gondola ride along the Grand Canal. Awake in Venice, where you will be departing your ship. From here, you can easily spend a few extra days to further explore this magical city or other parts of Italy. Please note: Price shown is in AU$, based on low season travel in a Veranda (V2) stateroom based on 20 March 2020 departure.